The history of the United States is often told as a movement westward, beginning at the Atlantic coast and following farmers across the continent. But cities played an equally important role in the country's formation. Towns sprung up along the Pacific as well as the Atlantic, as Spaniards and Englishmen took Indian land and converted it into private property. 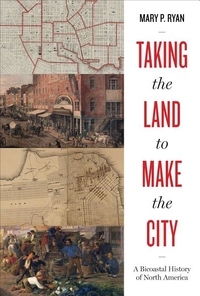 In this reworking of early American history, Mary P. Ryan shows how cities--specifically San Francisco and Baltimore--were essential parties to the creation of the republics of the United States and Mexico. Baltimore and San Francisco share common roots as early trading centers whose coastal locations immersed them in an international circulation of goods and ideas. Ryan traces their beginnings back to the first human habitation of each area, showing how the juggernaut toward capitalism and nation-building could not commence until Europeans had taken the land for city building. She then recounts how Mexican ayuntamientos and Anglo American city councils pioneered a prescient form of municipal sovereignty that served as both a crucible for democracy and a handmaid of capitalism. Moving into the nineteenth century, Ryan shows how the citizens of Baltimore and San Francisco molded landscape forms associated with the modern city: the gridded downtown, rudimentary streetcar suburbs, and outlying great parks. This history culminates in the era of the Civil War when the economic engines of cities helped forge the East and the West into one nation.